Great dividends can come from anywhere, and we're diving into three very different industries for three great dividend stocks. Dividend stocks can be a great way to generate income from investments, and they can also be a great way to beat the market long term. Paying a dividend can force a company to consider cash flow a little more than those who don't and may see their stock as currency with which to grow their empires. Strong dividend stocks can come from a variety of industries across the market, which can also diversify your exposure to any given industry. With that in mind, here's why I think Intel Corporation (NASDAQ:INTC), Las Vegas Sands Corp. (NYSE:LVS), and NextEra Energy Partners LP (NYSE:NEP) are top dividends on the market today. There was a lot of concern about Intel's future a few years ago, when it appeared the PC was dead and the company had missed out on the mobile revolution entirely. The PC's death has been prolonged more than many expected, but mobile is still a point of weakness. To adjust, Intel doubled down on data centers, the cloud, and the future of the Internet of Things. Long term, management thinks data centers is a market with more than double the revenue potential of PCs ($65 billion to $30 billion), and the Internet of Things will match the PC market in size. So, the company is building on a dominant PC business that will then fuel the products that will drive the cloud and the Internet of Things. The strategy has started to show promise in the last couple of years, with steady revenue growth and solid earnings, as you can see below. 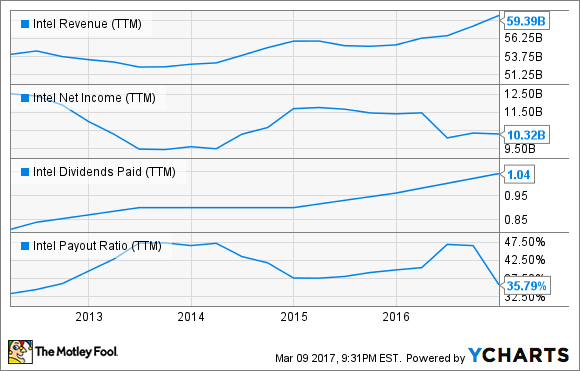 INTC Revenue (TTM) data by YCharts. What's important from a dividend perspective is that the payout ratio has stayed below 50%, despite the rising payout. And with a 2.9% dividend yield and tremendous growth opportunities as chips end up in more and more devices, I think this is a great dividend stock for the future. Las Vegas Sands isn't the biggest company in Las Vegas, but it's the biggest gaming company in the world. That's because of its market-leading position in Macau, which is more than four times the size of Las Vegas in gaming revenue, and the fact that it owns one of only two casinos in Singapore's lucrative market. That has led to a giant cash machine and a big dividend for investors. The chart below does a fairly good job of showing just how quickly the company has been able to grow EBITDA (a measure of cash flow from a large, upfront investment like a casino) while keeping the debt load fairly flat. And CEO Sheldon Adelson will likely keep the debt level about where it is because he's comfortable with leverage, and as the largest shareholder, he's the biggest beneficiary of a dividend. 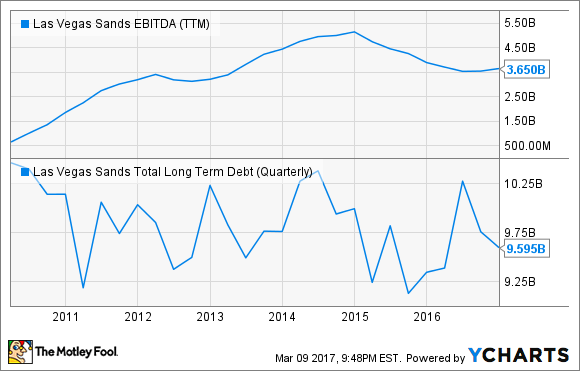 LVS EBITDA (TTM) data by YCharts. Unless the gaming industry collapses in Asia, which I think is unlikely, Las Vegas Sands will keep churning out cash and keep paying a dividend. And the dividend yield of 5.4% right now is a great yield for investors betting on gaming stocks today. Maybe the most stable dividend of this group is NextEra Energy Partners, a yieldco that owns primarily renewable energy projects with long-term contracts to sell energy to utilities. The idea of a yieldco is that the company can issue a combination of equity and debt to buy accretive renewable energy projects with contracted payouts. As projects are added, it will add to the dividend long term. What NextEra Energy Partners has going for it is its association with sponsor NextEra Energy and its relatively low dividend yield of 4.6%. In yieldcos, a low yield can actually be a good thing, because it allows you to buy projects and add to the dividend in the future. And if the dividend keeps growing 15% annually, as planned, the long-term yield for investors will be much higher than it is today. Broadly, renewable energy is an industry I think investors will want to have at their backs given the fact that most new power plants in the U.S. are now powered by wind, or the sun. And as costs fall, the industry will grow, increasing the opportunity for a company like NextEra Energy Partners.